Managed JusticeConnect Cloud is available for scheduled deployment. Offering an immediate path for your agency to leverage the features of JusticeConnect without requiring an on-site dedicated server to house the secure software environment. No CAD/RMS/CJI data is stored in the "Cloud" environment. 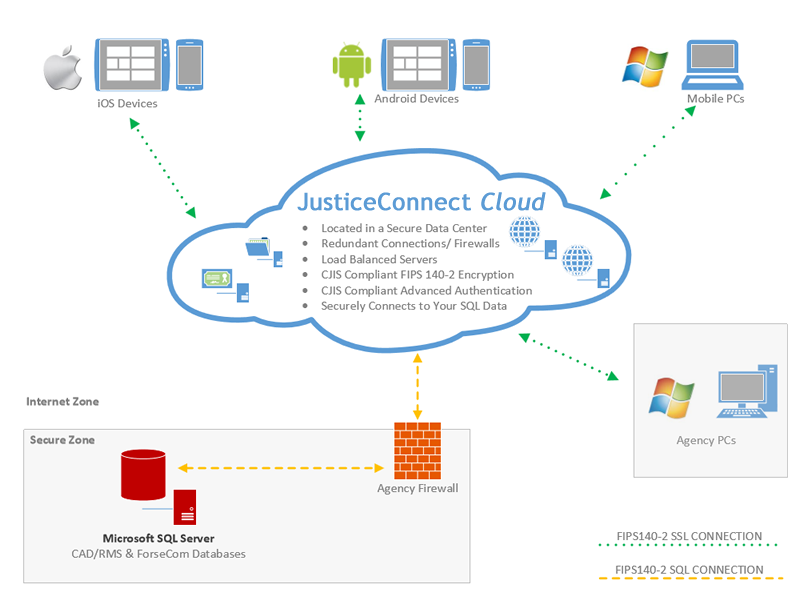 The JusticeConnect Cloud system connects securely back to your agency specific SQL Databases using FIPS140-2 encryption to act as a proxy connector to allow your mobile users access to CMI Justice. This system has been created to allow smaller agencies to have access to the new technology provided with the JusticeWeb product. Contact Us to schedule a DEMO and for detailed pricing.